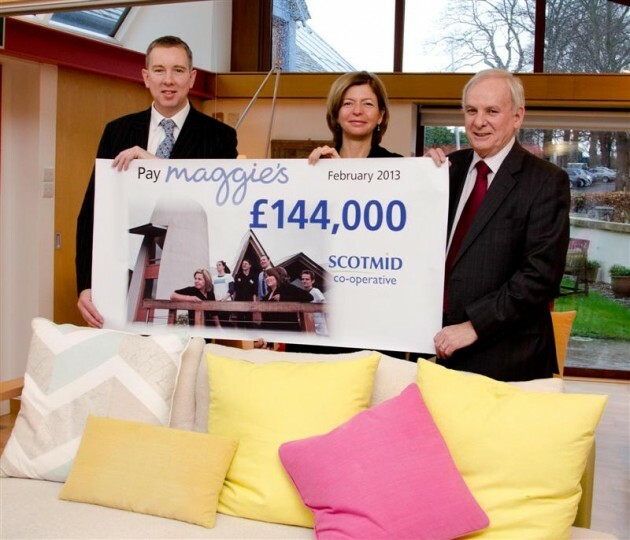 Scotmid Co-operative has announced that employees and customers have raised £144,000 for Maggie’s Centres, just halfway through their charity partnership year. The announcement was made at a special cheque presentation by Scotmid Chief Executive, John Brodie and Society President, Hollis Smallman, to Maggie’s CEO, Laura Lee, at Maggie’s Edinburgh on 1 February 2013. The news comes after a bumper six months of fundraising across all of Scotmid Co-operative including Food, Semichem, The Fragrance House, post offices and funeral branches. Staff have undertaken bungee and parachute jumps, a cycle across Britain, an abseil, fitness challenges, dress up days, bake sales, charity nights and raffles. The halfway result means that Scotmid Co-operative is well on its way to beating their £150,000 fundraising target for Maggie’s, with more initiatives and events planned for the coming months. 30 Scotmid staff will soon be completing the Maggie’s Monster Bike and Hike, a gruelling 30 mile cycle followed by a trek through the Scottish Highlands.